Here in Ireland, food and drink has always played a large part in all our lives – but in recent years it has become more important than ever in terms of the economy. Ulster Bank has watched this growth and change with interest, analysing the special industry requirements and unique business needs of this sector, and in response, has developed a suite of products and supports specifically for ‘Food & Drink’ businesses across the island of Ireland. As Ulster Bank’s branding partner, our task was to bring these to life in a meaningful and engaging way. Food & Drink is part of a suite of propositions that Ulster Bank has developed for SMEs, which includes specific support for those just starting out, i.e. Start-Ups as well as those in the Agri sector. 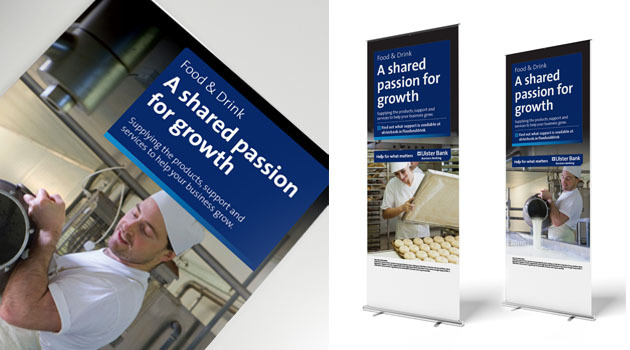 Given the natural element of cross-over between these 3 areas, we needed to ensure that the marketing collateral we developed felt part of the same family, whilst clearly signalling Ulster Bank as a credible player who understands the needs of the SMEs within the Food & Drink industry, ultimately positioning Ulster Bank as the ‘bank of choice’ within the sector. Food and drink is a very emotive industry and the focus on quality, care and attention given to the produce is key. The choice of imagery and copy taps into the passion and dedication of business owners in this sector, and elevates Ulster Bank’s intimate understanding of just what Food & Drink businesses need from their banking partner to help their businesses grow and achieve their full potential.